What progress did I make? I’ve build a tag-soup HTML parser, which can handle some pretty horrible, malformed HTML without breaking your website. It can filter out dangerous scripts and it attempts to create XHTML that is spec-compliant. There is still some work to be done here, but the progress on this area has been very good so far. I’ve also worked on the RSS/Atom parser. I’ve added support for the latest draft of the Atom specification and RSS 1.1, support for enclosures (podcasting) in RSS (also Media RSS from Yahoo) and Atom, improved support for inline XHTML in Atom feeds, support for inline XHTML in RSS 2 feeds and improved detection of escaped HTML content in all types of feeds. One other major change is the support for relative URLs in HTML posts and the xml:base attribute. Other changes are better character encoding support (the plugin now internally fully uses UTF-8) and some work on the admin area. I’ve also started work on the output of the plugin. Previously this was done by calling the database directly from an external script. As of today I also have a number of skinvars that can be used for this purpose. For those interested in taking a look, a new demo page is also up. As promised, I have made some screenshots of the administration interface. The interface is almost fully functioning, some smaller details still need to be looked at. 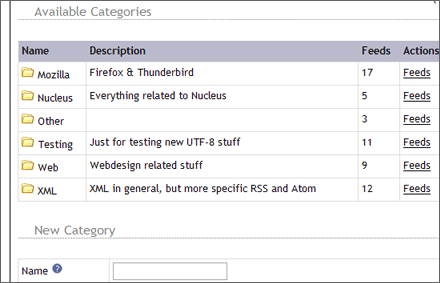 A detail of the main category overview. 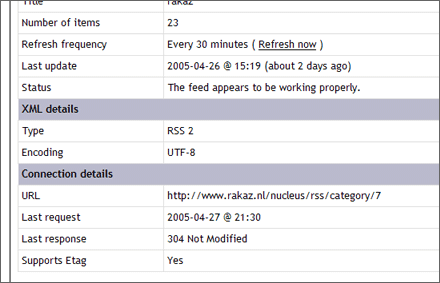 A detail of the feed overview of a particular category. 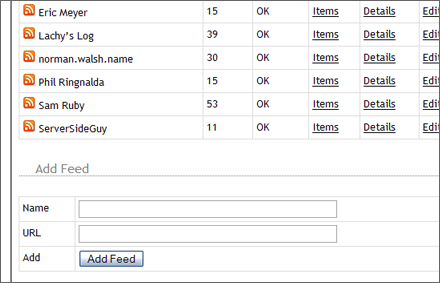 You can add new feeds, delete feeds and see some more details about feeds. Detailed information about a feed is available. This information will help you troubleshoot all sorts of problems. It is also possible to manually retrieve a feed. Good news, I can see many uses for this. Looking forward to the release is a gross understatement! Got a site set up to play with the planet plugin, for now I’m just using your xml tools to read in some feeds. Let me know and I can start testing it, thanks.